Amber From Around The World. From different parts of the world. Since the oldest times word Amber had only one meaning - the Baltic Amber. Baltic Amber was formed from a particular type of pine (Pinus Succinifera) and is called succinite. It contains 3-8 percent of Amber Acid. For a long time this feature of the Baltic Amber distinguished it from other Fossil Resins, which was found in different places. Processes that influenced the formation of Amber have left their traces in different parts of the globe because they had an effect on not only resins of Coniferous Trees, but also on resins of leaf-bearing trees and even leguminous plants. Although 150 types of fossil resins are known in the world, these resins are not Amber but its relatives. They are mostly found in Europe and America and each of them has its own name. Big deposits of fossil resins especially rich in inclusions have been discovered in the Arctic, North America (Alaska), Yugor and Taymyr Peninsulas and in the Carpathian region, especially in Romania. They are opaque, reddish-yellow, dark red, blue, dark green, fluorescent, and stink of sulphur and petroleum when burnt. In Sicily and in northern Italy deposits of dark red and yellow fossil resins of trees of the family Cupressaceae called Sicilian amber is found. Since the oldest times it has been used in the manufacture of adornments and Phoenicians new about its deposits. In Europe 50 types of fossil resins of different age are found. The oldest known Asian fossil resins (sometimes pieces have the size of a head) are found in Birma. They are mostly opaque, dark brown, sometimes - red and yellow and in the 18th century single beads of these resins were used by Tibetan Buddhists for the decoration of their rosaries. Fossilized Insects are especially common in fossil resins found in Mexico, Dominican Island, and Haiti. So-called Mexican amber is a result of resins of leaf-bearing trees and is widely used in jewelry. In Africa in the soil of no longer existing forests sub fossil resins of leaf-bearing trees are found and locals use them for making of adornments and amulets. Here are 31 examples: amber, fossil resin or Copal from different parts of the world, with a description of their main features; where it was found, age, mother-plant, colors, inclusions and their special characteristics. Found: in the Kurnub sandstone of Wadi Zerka north of Amman Age: 130 Ma. (Early Cretaceous period) Mother-plant: Agathis (Araucariaceae) Colours: mostly yellow, brown, and dark red Inclusions: quite rare, not well preserved, quite similar to those of Libanon amber Special characteristics: Agathis-like plants occur in the amber-bearing-strata. Found: mostly in Kuji (North Japan), also in Mizunami and Chosi. Amber from Kuji is deposited on the mountains slopes at about 600 metres depth. Age: Kuji amber is 85 Ma. (Late Cretaceous period), Chosi amber is 110 Ma. (Cretaceous period) Mother-plant: unknown Colours: from green to black, Chosi amber is a type with a very varied spectrum of colours, Mizunami amber is dark, brown or intensiv red colour Inclusions: rare Special characteristics: most of the pieces are cracked because of seismic tremors and the high pressure at considerable depths. The cracks often contain quartz crystals. Found: in various regions of Canada. 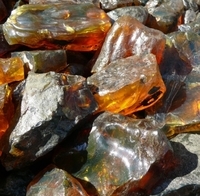 The term Canadian amber generally refers to amber collected in the vicinity of Cedar Lake, Manitoba. Age: 95-70 Ma. (Cretaceous period) Mother-plant: Agathis (Araucariaceae) Colours: red, brown Inclusions: contains many inclusions, mainly flies, bugs, and arachnids Special characteristics: It is found in areas where amber and dinosaur bones occur together. Found: in lignite layers just a few feet below surface, near the town Sayreville (New Jersey) Age: 80 Ma. (Late Cretaceous period) Mother-plant: Metasequoia (Taxodiaceae) Colours: yellow to red, translucent Inclusions: abundant, up to 100 unknown species of insects and plants were found Special characteristics: Amazing inclusions: the oldest known bee Trigona prisca. Found: in coal-beds of the Guchenzgi formation, near the city Fu Shun, province Liaoning Age: 60-55 Ma. (Late Paleocene to Early Eocene period) Mother-plant: unknown Colours: usually with a black weathering crust, after polishing transparent, yellow to brown Inclusions: contains many inclusions Special characteristics: The inclusions are badly preserved because of natural heating of the amber. Found: near the Oise river just outside Paris, in sandy, lignitic layers Age: 55 Ma. (Early Eocene period) Mother-plant: the Hymenaea tree Colours: single pieces with a typical frosted surface; after polishing mostly yellow transparent Inclusions: many inclusions, mainly arthropods, few plant fragments Special characteristics: The pollen extracted from the amber are close to a modern Hymenaea species, which today is found only in the Amazonas rainforest. Found: in lignite sandstones, near Fribourg and Bern Age: 50 Ma. (Late Eocene period) Mother-plant: unknown Colours: honey-yellow to orange-brown, transparent Inclusions: few plants inclusions Special characteristics: Under UV light the amber shows an intensive blue-white fluorescence. Found: in sands above and below the groundwater level in Western Ukraine (Parcew Delta, Klesov Delta) Age: 50-45 Ma (Eocene period) Mother-plant: pine tree Pinus succinifera Colours: mostly brown, brown-yellow, yellow transparent-red, light green, blue-greenish-yellow; translucent-light green; white with a green or blue tint Inclusions: less inclusions than in Baltic amber, due to the smaller amout of layered amber Special characteristics: Amber pieces above the groundwater level are usually covered with a typical dark-brown to black weathering crust. Found: in sandstones from the banks of the River Buzau, in the East Carpathians Age: 32-28 Ma. (Early Oligocene) Mother-plant: unknown Colours: brownish-yellow, red-brown, black Inclusions: very rare, not well preserved because of natural heating Special characteristics: famous for rich colours, ranging from brownish-yelllow to deep brown. Pieces of brownish red amber reflect a blue-green fluorescence, similar to that of the "blue amber" from the Dominican Republic. Found: in Sicily (South Italy) on the banks of the Simetus river Age: 25-22 Ma. (Early Mioceneperiod) Mother-plant: unknown Colours: raw-material black; after polishing, famous for its dark-red colours; also pieces with blue fluorescence Inclusions: rare Special characteristics: the famous Simetite collection of the Prince Ingnatius Piscary from Catania, which was mentioned by Johann Wolfgang von Goethe during his journey to Italy in the year 1787. Found: in sandstones at the Caribbean sea-shore of Nicaragua Age: 23-18 Ma. (Early Miocene period) Mother-plant: the Hymenaea tree Colours: varying from transparent yellow to red Inclusions: only a few up to now Special characteristics: newly discovered amber deposit. Found: in sand and claystones of the Northern and Eastern Mountain Ranges at elevations between 500 and 1,200 metres Age: 23-20 Ma. (Early Mioceneperiod) Mother-plant: the Hymenaea tree Colours: yellow, red, green, sometimes blue shades, 90% is trasparent amber Inclusions: many inclusions, fauna and flora reflect a dry tropical climate with many groups of organisms Special characteristics: There exist single amber lumps with an amazing number of inclusions, pieces with 10-50 ants or flies are not rare, but also such with 500-1000 occur. An unusally fluorescent variety which occurs only in limited areas is called blue amber. Found: deposited in lignite layers, mainly in Chiapas, to the East in the Lacondon jungle Age: 23-20 Ma. (Early Miocene period) Mother-plant: the Hymenaea tree Colours: varying from yellow to red/brown; special red translutient pieces and fluorescent blue green varieties are also found Inclusions: because of natural heating usually not well preserved Special characteristics: large Mexican amber lumps are often covered with large fossil oyster shells. Found: within a coal-seam of the Merit-Pila coal-mine in Sarawak, North Borneo, Malaysia Age: 23-15 Ma. (Late-middle Miocene period) Mother-plant: angiosperm tree of the Dipterocarpaceae family Colours: mainly dark-brown to yellow-brown, partly whitish Special characteristics: Worlwide largest pieces of amber, up to 30 kg..
Found: in Bohemia, near the village Dux Age: 20 Ma. (Neogene period) Mother-plant: Cupressaceae Colours: mostly opaque, dark yellow to brown Inclusions: none Special characteristics: occurs attached to or inside fossilized wood. Found: Pena Blanca Age: between 5000 and some hundred years Mother-plant: the Hymenaea tree Colours: pale yellow Inclusions: abundant, but modern fauna and flora Special characteristics: Larger pieces could be filled with some hundreds of termites. Found: embedded in about one half or one metre depth of the western coastal area of Madagascar Age: between 50 and 500years Mother-plant: the Hymenaea tree Colours: mostly transparent and pale yellow or brown Inclusions: many inclusions, but modern fauna and flora Special characteristics: All copal is soft and smears when it is ground or polished. Found: in Indian and East Asian forests, mostly by tapping the trees, some collected fossilized from the ground Age: recent Mother-plant: Dammar tree, from the family Dipterocerapaceae Colours: from clear to pale yellow, fossilized form grey-brown Inclusions: rare Special characteristics: Dammar was firstly used as a picture varnish in 1862, and is commonly referred to as Dammar varnish. *Known since the Stone Age. *Later extracted in enormous quantities. *A source of scientific studies in many faculties for more than 150 years. *Up to 5500 animal and plant species.